"A turf covered point projecting above the river in the shade of great trees served us as a table and we sat down to luncheon with a view of the river whose waters clear as crystal, snaked through the wood." Wouldn’t it be great to see the Cass River crystal clear again? That in part is what motivated a local group of citizens to form the Cass River Greenway Committee in 2007. 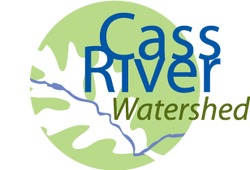 Organized by a group of local volunteers, assisted by professional resources and municipal leaders, the Cass River Greenway Committee is working to enhance recreational opportunities and the environmental wellbeing of the Cass River Corridor. To meet these objectives, the Cass River Greenway Committee is taking a regional approach in its efforts. Through development of recreational opportunities that enhance local quality of life and support development of eco-tourism, promotion and preservation of wildlife habitat and natural lands, and improvements to water quality, the Cass River Greenway Committee aims to engage and educate the local residents, property owners and visitors about the abundance of natural assets the region offers that support and strengthen the community and local economy. All too often, planning for recreation, water quality, trails, and open space ends at county, township, and municipal borders. Regions that don’t work together can end up with a patchwork landscape that doesn’t make sense and that separates communities. The Cass River Greenway Committee envisions connected communities, cooperation across borders, and stronger regional ties.